Cagayan Valley, from eco-tourism to gamefishing, have a go! The Cagayan Valley region is still untouched. Come and see it that way! Cagayan Valley is the second region and the most northerly you can travel within the Philippines. It includes the wind swept islands that reach almost to within 200 kms of Taiwan. Cagayan Valley lends itself to a facination not normally found, mainly due to the lack of transportation and facilities to accommodate tourists. A growing number of committed tourists are discovering what the Cagayan Valley has to offer. 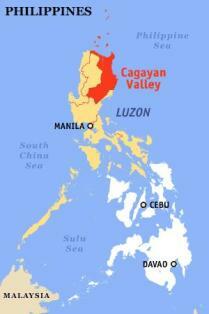 Cagayan Valley is composed of five provinces. The Cagayan Valley is jammed between the Pacific Ocean to the north and east and the Cordillrea Mountain Range to the west. It is the fourth largest region in the Philippines. Cagayan Valley also boasts the largest and longest river in the Philippines, with a drainage area of approximately 27,000 square km. Batanes are the island group to the north of Luzon. They are rugged islands which are divide the South China Sea and the rolling Pacific Ocean, when the seas are rough, look out! Batanes has been earmarked as a possible gatesway to Eastern China., It is one of the few provinces that enjoy four relativley distinct seasons. Tourism and development is a long way off, but if your a hardy adventurer, why not have a look. Cagayan Province is the ecotourism centre of the Cagayan Valley Region. Where you take expeditions trekking and caving into the untouched mountains or take a gamefishing trip and try your luck at catching the elusive monster from the depths. Getting here from Manila byroad is a journey in itself. A ten hour road trip is not everyones idea of good fun, but for the adventurous with time on there hands the road trip can be the adventure! For those who are short of time a one hour plane trip should suit. Isabela province on the east coast of Luzon is yet to see tourism flourish. Development id still in its infancy, the infrastructure is yet to be fully established, however the potential to develop the stunning coastal areas, is enormous. Isabela is known as the rice granary of the north. With terracesin full production casting a green glow through the steppes. Isabela has been gifted with an incredibly rugged and heavily forested Sierra Madre Mountain Range. A large slice of the range is yet to be fully explored. The mountains close to the Cordillera ranges rise to as high as 8,000 feet and harbours a low altitude rainforest, one of few low altitude reainforests in the world. The wildlife is particularly unique and yet to be fully understood, it is said that there is flora and fauna in the rainforest waiting to be discovered. Nueva Vizcaya is only about 270 km north of Manila. it is building a reputation as the next best thing for outdoor and environmental enthusiasts. Nueva Vizcaya is the gateway expoling the Cagayan Valley. Nueva Vizcaya has a much cooler climate than other regions in Luzon, mainly because of its mountainous geography and surounds. Nueva Vizcaya is an agricultural province and is yet to see tourism of any sort. Quirino use to be part of Nueva Vizcaya, it was described as the forest region, but is now the forest province. Quirino is surrounded by lush impenetrable mountains. In fact 80% of its land area is dominated by mountains, these mountains provide a natural barrier for visits to Quirino.